On Thursday, January 22nd, the opening night of the 2015 Sundance Film Festival, a fierce battle was lost halfway across the world. As told by The Washington Post: “The Ukrainian army retreated Thursday from key strongholds at the Donetsk airport, an epicenter of fighting in the country’s conflict-battered eastern region, handing a symbolic victory to pro-Russian rebels amid a surge of violence that threatens to further unravel peace efforts.” A few days later in Park City, The Russian Woodpecker premiered. Chad Gracia’s documentary (and first feature) chronicles an artist’s quest to unravel and ultimately prove one of the biggest conspiracy theories of all time. The film posits the Soviet Union’s persecution of the Ukrainian people, and effectively warns of its continuation today. At the center of the story is Fedor, an artist and wild-man, whose conspiracy theory that the Chernobyl disaster was intentionally orchestrated by a high-ranking Soviet official paints him as an unreliable narrator. With his long unkempt hair, baggy clothes and vibrating pupils, he could pass as homeless. However, as the film progresses, the ‘artist or idiot’ debate is quickly discarded as his investigation becomes increasingly intriguing. Fedor talks to (sometimes with a hidden camera) many officials, scientists, researchers and administrators who worked at or were associated with the Chernobyl plant. But Fedor’s gaze is actually focused elsewhere: at the multi-billion dollar behemoth that lies dormant next to the plant. The ‘Duga’ is an otherworldly creation, a colossal mass of steel and wire that’s breathtakingly photographed with aerial drone cameras as Fedor climbs its mile-high ladders above the treetops. Apparently this contraption was created to emit a 10 beat-per-second ‘pecking’ radio wave that was intended to interfere with US communication systems and, perhaps even more deliriously, impart some sort of mind control. This may seem unbelievable, and you’re right: it didn’t work. The filmmakers argue that the Northern Lights disrupted the signal to the US, but whatever the case, it was a gigantic waste of time and money. The conspiracy goes that a week ahead of a planned inspection of the Duga, the person responsible for its creation made a call from Moscow to the Chernobyl plant, and ordered a dangerous directive that caused the explosion, to cover up his costly and worthless endeavor. The quest for truth is a very personal one for Fedor, who was four years old when the explosion happened. He lived in a city nearby and was affected by the radiation. 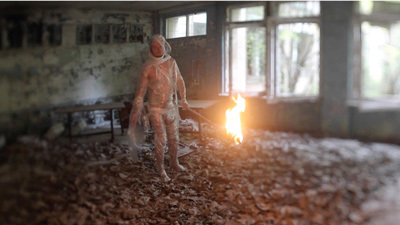 The scenes of him exploring the ghost towns surrounding Chernobyl, including one of an elementary school littered with child-sized gas masks, are visceral and haunting. Gracia and the documentary’s editor, Devon Tanchum, do a wonderful job in portraying Fedor’s personal relationship to the topic. Intercut with interviews and footage of the disaster’s aftermath are moments of Fedor’s artistic expression. The artist is always present. And as the film progresses we come to see him as less of a goofball and more of a hero. The intensity really builds as external events collide with our narrative. Crimea is invaded and the arm of the former Soviet Union is felt once again in Ukraine as protests and fighting erupt. Unlike The Square, which focused entirely on the Arab Spring in Cairo, The Russian Woodpecker uses footage of the recent fighting to punctuate a longer narrative—one of persecution of the Ukrainian people for decades and the looming danger of the continued Russian conquest. The KGB threatens Fedor and his son, but they are unable to silence him for long. Instead, he literally takes the stage in the midst of a heated battle and condemns the Russians for their genocide against the Ukrainian people, from Chernobyl to Georgia to the present. He draws a convincing and terrifying road map to WWIII. While this may sound dystopian, it doesn’t seem too far-fetched, and the documentarian’s social agenda is one of the grandest and most noble I’ve seen in a long time. There is hope with people like Fedor and his cameraman Artem—who was shot in the bicep while filming—that we can change the course of history.